Sochi 2014 is a debacle. The past week or so has been all about the coverage of unfinished hotels, major infrastructure issues, the killing of Sochi’s stray dogs, and ridiculous inadequacies of some of the Olympic venues. But this was a debacle way before all of the “Where the hell did the $51 billion go?” questions were asked. It’s about human rights and Russia’s apocalyptic decision that only heterosexual people have them. This isn’t the forum to debate whether Russia’s LGBT laws constitute a human rights violation – and I honestly can’t see where there’s anything to debate – but there are sponsors involved, and that I’m happy to address. To be clear, sponsors aren’t investing in Sochi Olympic sponsorship because they’re evil. They invest in a Summer/Winter Games cycle, so they can’t pick and choose which Olympics to sponsor. And if they walk away from an IOC sponsorship around a specific cycle or Games, chances are that some competitor will walk right in and they won’t get another chance to be an IOC sponsor for some time. This puts sponsors in an awkward position, and they couldn’t possibly have been more awkward about it. We are now in the fourth – or “last” – generation of sponsorship. (For more on that, read “Last Generation Sponsorship”.) It is widely recognised that sponsorship is no longer win-win, but win-win-win, with that third win going to the target markets. This comes from the understanding that sponsorship offers brands the privilege of connecting with fans through something that they already care about, and smart sponsors know that understanding, respecting, and adding value to that experience is the most powerful way that they can create a marketing platform for their brands. The sponsor can add value to fans’ experience with whatever they’re sponsoring – amplifying the great stuff and ameliorating the worst stuff about it. The sponsor can use the sponsorship to add value to people’s experience with their brand. The sponsor can align with the fans’ passions and disappointments. The sponsor can use their position to amplify fans’ legitimate concerns so that the property has to take notice. That last point doesn’t happen that often – and frankly doesn’t need to – but there are some instances where corruption, systemic cheating (eg, drugs or doping in sport), bad choices, and/or hypocrisy are tainting the very thing that those fans are so passionate about. They’re angry, they want change, and nobody who can make change is listening. Sochi 2014 is one of those moments. Those giant IOC sponsors must have bought all of the rhetoric hook, line, and sinker, because even after Russia passed the first tranche of anti-LGBT legislation in July 2013, they continued to plan big Olympic leverage programs. And I have to say, some of those leverage ideas were fantastic, but not for Sochi. Did they miss the rainbow crossings? The hundreds of couples who line up for hours to be amongst the first to be legally married in their states? The thousands and thousands of memes on social media supporting gay rights? For as out of touch as their sponsorship leverage activities have been, it’s as if their entire marketing teams have been sequestered in some bunker underground and just missed the world changing… for the past five, ten years. It appears that they have been too focused on recouping their investment and maximising the marketing platform to pay any attention to how incredibly asynchronous Russia’s new laws (and the defence thereof) were with the growing global sentiment for marriage equality and equal rights for LGBT couples. And in this, there is a lesson for sponsors: Wishing something isn’t political doesn’t make it so. And carrying on as if this is just another sporting event has made those sponsors look, at best, like idiots, and at worst, like they’re sanctioning the violent suppression of human rights. The response of both Olympic fans and, well… fans of human rights… has been nothing short of breathtaking. 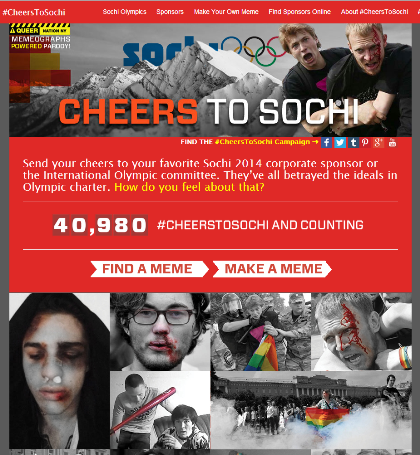 Almost immediately, a parody website – www.CheersToSochi.org – was launched. It looked almost identical to McDonald’s site, but provided a platform where people could download or create their own anti-IOC and – most pointedly – anti-SPONSOR memes for use in social media. Do yourself a favour and have a look. It’s the starkest reminder I’ve ever seen that people do hold sponsors responsible for investing in events that are counter to accepted social mores. McDonald’s has now removed their own site and the original domain points to a generic page of their website, and the hashtag they initiated – #CheersToSochi – has now been hijacked by protestors. It’s all over Twitter. Coca-Cola created a site where people could create their own messages on virtual Coke cans that they could use in social media. When they decided to ban use of the word “gay”, all hell broke loose. The cans themselves have become a social media meme, one of which is at the start of this blog. And Queer Nation NY recreated the iconic “I’d like to buy the world a Coke” ad from 1971, with devastating effect. The lesson to all sponsors should be crystal clear: We are well past the point where you control the message. We shot past that point seven, eight years ago at about 200 kms per hour. All the $100 million payments and rightsholder assurances and lawyers in the world will not retain that control for you. It’s gone. Your only recourse, if you want to avail yourselves of ANY of the truly effective, interesting ways to leverage a sponsorship is to pay attention to the people and create leverage programs that are reflective of their actual experiences and their passions, not some sanitised, corporatised experience. And if you get it wrong, admit it and change tack. Saying “we got it wrong” isn’t an affront to brand marketing, particularly if you then do what you can to make it right. Normally, as we run into an Olympics, you can’t turn around without seeing sponsor leverage. Normally, McDonald’s stores are full of Olympic-branded stuff, there are limited edition Coke cans, P&G is thanking mums, and on and on. Every sponsor brand has promotions and offers and major new ad campaigns all around the Olympics. How much of that have you seen this time around? Not much, I’m guessing. The Olympic TOP sponsors appear to have gone missing in action. Clearly, the sponsors have been talking about the potential diminishment of their marketing platform for some time, but one of the most stunning things about all of this is that sponsors appear to have been genuinely surprised at the fact that they’ve been brought into the controversy. It has now been over seven months since the first tranche of anti-LGBT laws came into effect in Russia, and coverage has been ample. The other option, of course, is that they did see it coming and just didn’t care, but I’d like to hope that, while our industry can sometimes be a bit thick, we’re not bloodless. To be fair, Winter Olympic leverage activity tends to happen within a shorter window before the event, so once initial social media activities started to go bad, it’s not surprising many activities didn’t launch at all. Many have decided to just concentrate on the Russian market. Samsung is an IOC TOP sponsor, and have been reasonably active, but the lion’s share of their leverage has been around athlete sponsorship, not the Games themselves. Marketing Magazine (UK) asked all ten worldwide Olympic sponsors “what they are doing to speak up for gay rights”. You can see their responses right here. You will note that several of them reference the specific Olympic tenets of “excellence, respect, and friendship”, but they seem to have missed key points of both the Fundamental Principles of Olympism and the Olympic Mission, both of which can be found in the Olympic Charter (pages 11 and 16). But referencing those points would call even more attention to the IOC’s hypocrisy and their massive financial investment in it. While they’re all gold medalists in politically-correct rhetoric, it is both predictable and bad for their brands that they don’t address the Sochi Olympic debacle directly. Instead, it’s a bunch of banal blah-di-blah that might have come out of a PR 101 course. This is particularly wrong, given the extent to which some of those brands really do embrace equality and acceptance as part of their corporate culture. Forget the fans for a moment, what do their staffs think? Why would they do this? I think they’re afraid of the IOC – so afraid that they would rather alienate a good chunk of their target market, appear disingenuous to their staff, and run counter to some of the basic building blocks of their corporate cultures than run the risk of not being invited back to the next “good” Olympics. “AT&T is not an IOC sponsor, so we did not receive the HRC request. However, we are a long-standing sponsor of the United States Olympic Committee (USOC), we support HRC’s principles and we stand against Russia’s anti-LGBT law. Attention Olympic TOP sponsors: This is how it’s done. This is what it looks like when your marketing and corporate cultures align. This is what it looks like when your marketing reflects who your target markets are and what they care about. This is what it looks like when you do the right thing. Bloody hell, how hard is it?! The question on the top of my mind right now is whether sponsors of major events will learn anything from this? It won’t take long to find out. In just a few months, Brazil hosts the FIFA World Cup, and in 2016, Rio hosts the Summer Olympics. In case you haven’t been paying attention, the human rights abuses they have been perpetrating in the name of major event preparation is jaw dropping. Will FIFA World Cup sponsors speak out this year? Will they amplify the voices of the fans? Time will tell. More telling, however, will be what the Olympic sponsors do. There is over two years before the Rio Olympics. There is time to effect change. There is time to use that sponsorship as a lever for what is good and right. Those sponsors have seen firsthand what happens when they ignore controversy. What will they do now? Please, sponsors, for the good of the fans, the world, and your brands… do something. Interested in my take on IOC hypocrisy? You should read “IOC Gets a Gold Medal in Hypocrisy“.